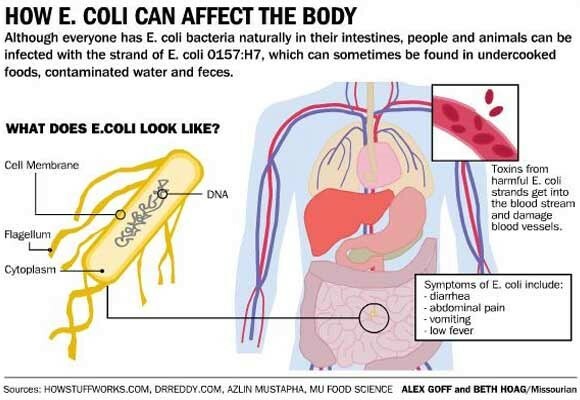 32 STATES INVOLVED IN E. COLI OUTBREAK — IS YOURS ONE? On April 10, 2018, the Center for Disease Control (CDC) issued a statement saying that they were investigating a multistate outbreak of Shiga toxin-producing E. coli O157:H7 infections. 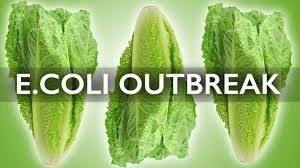 Signs and symptoms of E. coli O157:H7 infection typically begin three or four days after eating contaminated lettuce. The source of the contamination remains a mystery, but most victims ate pre-chopped bagged lettuce. Since April the outbreak has grown to 172 cases in 32 states: Alaska, Arizona, California, Colorado, Connecticut, Florida, Georgia, Idaho, Illinois, Iowa, Kentucky, Louisiana, Massachusetts, Michigan, Minnesota, Mississippi, Missouri, Montana, Nebraska, New Jersey, New York, North Dakota, Ohio, Oregon, Pennsylvania, South Dakota, Tennessee, Texas, Utah, Virginia, Washington, and Wisconsin. 70 percent of those infected have been hospitalized and several have developed a type of kidney failure called hemolytic uremic syndrome (HUS). On May 1, 2018, it was reported that one death occurred from the outbreak in California. Immediate medical attention required. Tests allow doctors to trace the cause and identity of the illness. Blood tests are not enough, diagnosis must be made by stool sample. Andrews & Thornton has a long-standing record of successfully litigating foodborne illness cases. If you or someone you know has been affected by this outbreak, we can handle your case and get you the justice that you deserve.